Dubai Municipality has put in place an effective system to ensure that the food you consume is always safe. However, we also understand the every link in the food chain from farm to fork can introduce food safety hazard. This makes food safety the shared responsibility of the government, the food industry and the consumers. At home, consumers play an important role in making sure the food they prepare and serve is safe. You should know that bacteria can be found everywhere: in the air, soil, and water, as well as inside your body and on your skin. Some bacteria are helpful, and even necessary, but others are harmful. Some harmful bacteria come into the kitchen through raw materials, especially meat and poultry products, and once there, they can contaminate other foods and make you ill.
We can certainly take steps to prevent harmful bacteria from spreading in food and potentially causing foodborne illness. One of the first steps you can take is to be informed and Mr. 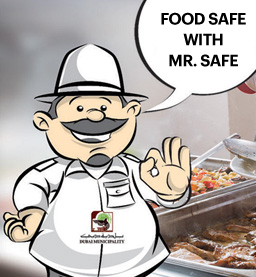 Safe is your food safety partner who goes around sharing food safety tips. Your best defence against foodborne illness is to read, learn and follow these food safety practices. Through Mr. Safe, Dubai Municipality wishes to bring food safety messages closer to your heart.